[page xxi] We learn how the first sacrifice made it possible for the human sense organs to be selflessly self-clearing, rather than suffering with every sense impression and being unable to get rid of it; how the second sacrifice accomplished a similar deed for the life organs, making it possible for us not to be torn apart by conflicting desires of our separate organs; and how the third sacrifice made possible the harmony of our human soul forces of thinking, feeling, and willing. As for the Mystery of Golgotha itself, it made possible the right relation of the "I" to the world. Thus — staggering thought — Christ is present in all by which we do — and can — become human. Reading to the dead is a process recommended by Rudolf Steiner in many lectures, saying that it is a great comfort to those living in the time between death and a new birth. In his first lecture, he reveals why this is a comfort, namely, that our loved ones who are in the time between death and a new birth cannot perceive any of us who have not worked with spiritual-scientific thoughts. When we are reading spiritual scientific works with them in mind, we can be assured that they can perceive us, hear our thoughts, and are very comforted by that. To understand how this works, we need a knowledge of the akasha or akashic substance. [page 2] One of the subtlest substances accessible to human striving is called "akasha." Beings and phenomena manifested in the akashic substance are the subtlest of all those accessible to human beings. What human beings acquire for themselves in esoteric knowledge not only lives in their souls, but is also impressed in the akashic substance. When we bring an idea from esoteric science to life in our soul, it is immediately inscribed in the akashic substance. It is significant that such impressions, which are significant for the general development of the world, can be inscribed in the akasha only by human beings. It is important for us to note a special characteristic of the akashic substance. Between death and a new birth, human beings live in that substance, exactly as we, for example, live here within the atmosphere on Earth. [page 3] A seer found a man who had gone through the portals of death, leaving behind his wife, whom he loved no less. This man and his family were likable, good people, but they had no inclination to take spiritual understanding into their souls, and they had never grown beyond the religious traditions through which certain souls even today feel themselves connected with the spiritual world. A while after he had gone through the portals of death, the man came to this realization: I have left behind on Earth my dear wife and children who were the sunshine of my life, but with my spiritual vision I cannot reach them. I have only the memory of the time that I passed with them on Earth. In the contrary case, if his dear wife had undergone some spiritual-scientific learning, she could be a great blessing to her departed husband, even if he never had a spiritual thought in his own lifetime on Earth. [page 3] Here we touch a point that shows how anthroposophical teaching will remove the chasm between the so-called living and the so-called dead. Today we can already see how people with understanding for the spiritual can be a great blessing for the so-called dead by reading and thinking the truths of spiritual science for them. When we follow in our thoughts, either reading aloud or to ourselves, the ideas and concepts of spiritual science and at the same time feel that one or several of those who have passed through the portals of death are sitting before us while we read, then our reading becomes something very present for them, because such thoughts are inscribed in the akashic substance. And this reading can be of great advantage, not only to those on the other side of death, who studied spiritual science while on Earth, but also to those who wanted nothing to do with it while they were here. It is in the very nature of the spiritual science that its ideas and concepts are stored directly into the akashic substance, variously called akashic record or chronicle. It is a living legacy which Rudolf Steiner left us that has benefited countless thousands of the so-called dead, bringing them comfort and contact that would have else never been possible. But there are many concerns of our everyday life which cannot make it into the akashic substance, for example, business has no business in the akasha. [page 4, 5] Spiritual science works out ideas and concepts that remain eternally written in the akashic chronicle. But when all the knowledge and understanding that belongs to experience gained through the senses-to technical matters, and to the commercial and industrial life of humanity — is inscribed in the akashic substance, the akasha repels this conglomerate of ideas and concepts; in other words, that knowledge and understanding is obliterated. Can spiritual science be understood by someone who has no ability to see into the spiritual worlds as Steiner did? Yes. Whereas a person might not have enough mathematical training to understand ordinary science, only a clear thinking ability and a curiosity is necessary to understand spiritual science. Steiner has helped make this available to everyone by converting the esoteric science of Theosophy with its polysyllabic tongue-twisting Eastern jargon into our normal everyday language of reason. Given that Steiner communicated in German over 90 years ago, his written works require careful translation into modern English to make it accessible. [page 5] Many people now say that, while ordinary science is open to all, spiritual science can be brought only to those who can see into the spiritual worlds. There is a fundamental fallacy in this statement. In the depths of their souls, all human beings possess, even before they, become clairvoyant, the ability and the power to understand the truths of spiritual science. It is true that only the clairvoyant can discover esoteric truths, but once they are discovered and expressed in the normal language of reason, they can be understood by any human soul willing to clear away the impediments to such understanding. [page 6] This experiment will have a totally different effect on a person who has religious, reverent inclinations toward spiritual life than it will on someone accustomed to thinking in a materialistic way. A person who has no esoteric knowledge but has inclinations and feelings of a religious nature toward the spiritual world can end up feeling somewhat insecure as a result of this experiment — much less so, however, than a materialist who has no feeling of attraction for the spiritual world. The latter will experience a powerful feeling of fear, of uncertain floating. Materialists can convince themselves with this experiment that occult ideas and concepts touch them in a way that elicits fear and terror. Through an experience of this sort materialists can recognize how full of fear they still are — they are not only fearful of this whole field but fear is one of their fundamental tendencies. The evolution of the human being is not amenable to our usual methods of examination of skeletons because most changes are internal to our way of thinking and perceiving. Even now a new organ of perception is developing in the depths of our brains which when mature will allow us in a future incarnation to remember this current incarnation, something most of us are unable to do with our current human capabilities. [page 8] Human beings, who are presently inimical to Anthroposophy, as well as those who maintain a sympathetic attitude toward it, will possess this organ in a future incarnation. In the future this organ will be the physical instrument for certain powers of the soul, just as, for example, in the third layer of the brain, Broca's area is the center for the faculty of speech. When it is developed, humankind can either use it properly or not. It will be used well by those preparing to remember their present life in future incarnations, for this physical organ will be the physical means for recollecting an earlier incarnation. This new ability might seem far-fetched to us today, but you and I possess thinking abilities which were undreamt of by most humans during Atlantean times as only high initiates possessed those abilities. When one studies spiritual science, one is able to spot signs of our present abilities as they first appear in prominent figures of ancient history, the Prophets, for example, Abraham and Moses who possessed the first "I am" conscious in recorded history, which allowed them to lead their people. [page 9] Today the remembrance of earlier incarnations can be attained only through higher spiritual development, through initiation; but that which in present times can be attained only through initiation will later become in a certain way the common property of the human race. Our present knowledge was earlier the special knowledge of Atlantean initiates. Now everyone can possess it. In the same way, memory of earlier lives on Earth is presently possible only for initiates, but in the future every human soul will possess this capacity. 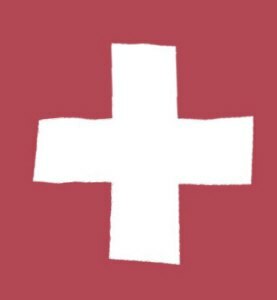 The Boy Scouts' motto of "Be Prepared" provides us each an impetus to study Rudolf Steiner's spiritual science. Why? Because it will make us ready to remember in our next lifetime what happened in this one. [page 10] Many people today, however, are unwilling to devote themselves to the study of this knowledge. Such people will be reborn, perhaps in their next incarnation, with the aforementioned organ for remembrance of earlier lives physically formed, but they will not have prepared themselves to remember the past. Diseases happen in our body if we have some organ we cannot use, nervous diseases, as if the brain is trying its best to use the disabled organ, filling the nerves with signals for this one organ to no avail, and causing signals to other healthy organs to get delayed or never arrive, similar to traffic jams on an Interstate when some construction is going on. Those who arrive in future incarnations un-"Prepared" to use their nascent organ of remembrance will be subject to nervous diseases. [page 10] In the future there will be people who can use the organ for remembering earlier lives on Earth and others who will not be able to use it. Certain diseases will manifest in the latter, because they will have an organ in their physical body they cannot use. Possessing an organ being unable to use it calls forth nervous diseases of a very particular kind, and these nervous ailments will be far worse than all that human beings have known until now. What happens to those who arrive unprepared? Can they make it up in the next lifetime? Yes, but the window for doing this will shut within a couple of lifetimes. To be unprepared is a hazard the longer you try to survive without appropriate preparations, and for future incarnations, learning the truths of spiritual science will be a requirement for those who would survive the ultimate reunion of the Earth and the Sun. Staunch materialists will remain on Earth, unprepared through a myriad of incarnations, and will enter the fires of the Sun, literally a hellish death. [page 12] This idea cannot derive from sense impressions because, for the external senses, it is not true that wisdom lives in the light. In such a situation we restrain the thinking through meditation so that it does not connect itself to the brain. If in this way we develop an inner activity of thinking that is not connected to the brain, we ill fell, through the effects of such a meditation on our soul, that we are on the right path. Since in meditative thinking we do not call forth any destructive process, thinking of this sort will never make us sleepy, no matter how long it is carried on, something that our ordinary thinking can easily do. Sitting in a lecture, in my experience, no matter how interesting, can make me sleepy in short order, but sitting in zazen for twenty minutes without allowing any thoughts to remain but simply pass through I am as refreshed at the end of the session as in the beginning. Stay awake and meditate! If we meditate upon the content of this phrase, "Wisdom shines forth in the light", then "We can feel our own being connected to the radiant force of light and can make this light shine and vibrate through the world." [page 15] When we meditate in such a way that our meditation is filled with the impulse of the will, we restrain a force that otherwise would flow into the pulsation of the blood. You can easily observe that the life of our inner "I" can flow into the pulsing of the blood if you recall that we become pale when we are afraid and blush when we are ashamed. That is the overflow of soul force into the pulsation of the blood. As we approach the Mystery of Golgotha, we do best to understand that it is a mystery, and one that is not easily explained or understood. 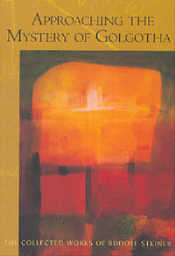 If we do the work to understand it as best we can we arrive at, if not a complete understanding, at least an understanding of the reason why Steiner refers to the entire set of events in physical and spiritual world as the Mystery of Golgotha and not by such other terms as the death of Jesus, the Crucifixion, the Resurrection, etc, because all other variations leave out some essential part. [Page 18] The Mystery of Golgotha is the most difficult of all mysteries to understand, even for those already advanced in spiritual knowledge, and is the most easily misunderstood of all truths to which human beings can relate. This mystery was a powerful impulse in the development of humanity on Earth. It was a unique event in the evolution of the Earth, one that had never happened before in the same way and will never happen again in the same manner. Human understanding is always looking for a standard, for a comparison in relation to which things can be understood, but something that is incomparable cannot be compared. Because it is unique, it is understood only with difficulty. Our method of understanding which begins most often with definitions following by logical deductions based on our initial definitions will not serve us well in understanding the Mystery of Golgotha. Why is this? [page 19] Human understanding is above all fond of making distinctions. To understand something requires a definition. Those among you who have attended my lectures relatively often will have noticed the lack of almost any kind of definition. One cannot comprehend the objects of reality through definitions. There are, to be sure, good definitions and bad definitions, definitions that are comprehensive and others that are less satisfactory. Definitions are necessary to understand earthly matters, but if one wishes to understand things that pertain to reality, namely things that pertain to the supersensible reality, then one cannot make definitions. One must describe — characterize, depict — for it is necessary to consider facts and entities from all points of view. Steiner reminds us of the classical Greek definition of man as a "featherless biped". One need only examine a plucked rooster to prove the definition is misleading, but if one merely sloughs off this example as trivial, one misses the key point: that definitions are merely maps and maps cannot represent all the territory as Korzybski proved to us in his Science and Sanity. Treating definitions as identical to the territory they represent subjects us humans to horrendous kinds of semantic reactions and nervous disorders which keep psychiatrists and psychotherapists busy. Scientists who claim their goal to be understanding of the secret of life are attempting to use their sensory-based data to unravel the secrets of a process which is non-sensory based. They are like Nasruddin searching for his key under the street light because there is more light there, instead of searching inside the house where the key was lost. Scientists as these are forbidden by their own basic tenets from ever entering the house (the world of spiritual realities) and yet they seek the key to the secret of life where it does not and cannot exist, namely, in the world of the senses. Rightly understood, such scientists are dreamers! [page 23] There are indeed dreamers in our day who believe that true understanding of the principle of life will be attained in the fullness of time through scientific knowledge; but that will never be the case. During the course of earthly evolution many laws are yet to be discovered through the senses, but the principle of life as such can never reveal itself in this way. Such a revelation can occur only through the methods of esoteric knowledge. On page 26, Steiner reveals that the inspiration for those materialistic dreamers we call scientists came from the Archangel Gabriel whose reign as an inspirer of humans lasted from 1510 through 1879, the period of time during which humans made great advances in sensory-based science and technology. With the advent of Michael's reign in 1879, the time for inspiration of humans to spiritual science came. We are as far into our understanding of spiritual science as humans were into understanding physical science in 1640 around the time of the birth of Isaac Newton. 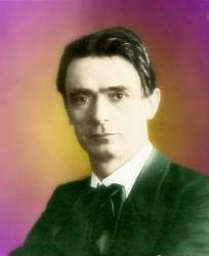 Rudolf Steiner's position as the father of spiritual science mirrors the position of Francis Bacon's position as the father of physical science, both arriving on the scene during reign of a new Archangel, Bacon for Gabriel and Steiner for Michael. The Biblical words which predict that Christ Jesus will "come again in glory" during His Second Coming is often misunderstood as meaning He will come down from the clouds. The word glory meant simply the etheric body, a body that can only be seen with spiritual sight, such as angel can only be seen in an etheric body. Steiner predicted in several places that the return of Christ in the etheric plane would occur about 1928 or so. In this book, he makes a prediction of the return of Christ during the twentieth century. Given the world-wide increase of humans perceiving the Christ Jesus appearing to them, especially in times of trial when they have called to him in help, but even non-believers of other religions who have never studied about Christ Jesus have reported his appearing to them. One man was in an isolated tribe and strove to get an explanation of who this being was and finally discovered a missionary who was amazed to hear this so-called pagan describing the being of Christ Jesus appearing to him. [page 28] In a certain sense, one can predict from this that, from the twentieth century onward, what humanity has lost in consciousness will certainly arise again for clairvoyant perception. In the beginning only a few, then a constantly increasing number of beings in the twentieth century will be capable fo perceiving the appearance of the etheric Christ, that is, Christ in the form of an angel. One can say that, at the time of the Mystery of Golgotha, something happened in a little known corner of Palestine that was in fact the greatest event that ever happened to all of humanity, but of which little notice was taken by people of the time. If something like that can happen, can we be surprised when we hear what happened in the nineteenth century when those who had passed through the portals of death since the sixteenth century encountered Christ? What do materialists carry with them into the spiritual world? It is like a "black sphere of materialism" — for if wisdom springs forth in the light, then the lack of wisdom springs forth in darkness. It is in a sense a repetition in the nineteenth century of the darkness which led humans to crucify Jesus almost two thousand years earlier. [page 28, 29] "The seeds of earthly materialism" — souls stepping through the portals of death since the sixteenth century have carried up to the spiritual world in ever-greater proportion, creating more and more darkness — make up the "black sphere of materialism." This black sphere was taken up by the Christ into his being in the sense of the Manichean principle, effecting a "spiritual death by suffocation" in the angelic host among whom the Christ being has manifest himself since the Mystery of Golgotha. This sacrifice of Christ in the nineteenth century is comparable to the sacrifice on the physical level in the Mystery of Golgotha and can be designated as the second crucifixion of Christ on the etheric level. The spiritual death by suffocation that accompanied the dissolution of consciousness of the angelic being is a repetition of the Mystery of Golgotha in the world lying directly behind ours, so that resurrection of the previously hidden Christ consciousness can take place in the souls of human beings on Earth. This return to life is in the process of becoming the clairvoyant vision of humanity in the twentieth century. Leading us on our journey into consciousness of the spiritual world is the Archangel Michael. This inner power of revelation will enter a greater and greater number of human beings as we advance further into the new Age of Michael and spiritual science becomes a new way of being, a new way of wisdom infused with the light of Michael. [page 31] This is what we call wisdom. It is what many call foolishness. To be firmly present, we need only to remember today that the present time is the time of the second revelation of Michael, and to remember also what was said by one of the ancient initiates, Paul, at the time of the first revelation of Michael, "What often appears to people as foolishness is wisdom before God." We are living in the fifth post-Atlantean cultural epoch and each one of these time periods had a different kind of wisdom or human understanding at work. In the Old Indian period, it was the a "lofty, intensive human intelligence and a high order of human insight into certain world secrets" what may be called the etheric body working in human nature. We see glimpses of this intelligence and insight in the ancient religions and art of India yet today, something Westerns find difficulty in fathoming. The Old Persia period followed thereafter with its emphasis on the astral body (sentient body) which showed in their focus on the building of permanent structures of hard substances. Next came the Egyptians and Chaldeans with their sentient soul focus upon astrology, the interactions of the stars with human beings. Following them the Greeks and Romans with their advanced ways of thinking and laws based on the intellectual soul. This last period lasted from 800 B. C. to 1500 A. D. and ushered in its wake our current age of the consciousness soul(3). To illustrate how important it was for the Christ to appear on Earth during the first third of the intellectual soul age, Steiner describes how the people in the various ages before that time would have reacted. [page 57] Hypothetically speaking, if Christ had appeared on Earth among the holy Rishis of ancient India, for example, people would have easily understood the nature of the Christ being, just as they would have in ancient Persia, where doctrines of the Sun-Spirit were taught. If Christ had incarnated in a human body then, one would have recognized this spirit walking on the Earth in a human body as the Sun-Spirit descended to Earth. For that matter, something similar could have occurred in the time of Egyptian temple wisdom. However, human beings had the least understanding of the nature of Christ during that period in which Christ appeared among them. In a way, Paul understood the nature of the Christ better than the other disciples because of his having been a Hebrew initiate schooled in Mystery Schools which traced their origins back to Zarathustra in the Old Persia age. He had learned to see the "Sun at Midnight" by looking through the Earth to witness the spiritual light of the Sun God, the Christ spirit, which shone unabated from the Sun through the body of the Earth. He understood the Christ better than he did Jesus of Nazareth, whom he persecuted as another heretic, a would-be Messiah, a lowly carpenter acting as a teacher. But after the Deed on Golgotha, Saul saw the rays of the Christ spirit poured out of the Earth in the middle of the day on his way to Damascus, and he knew instantly that the heretic he had persecuted onto his death was indeed the carrier of the Christ walking on Earth. Knowledge that would have been obvious to the average man in previous ages was impervious to the brain of the intellectual soul of Saul, up until then. While other disciples focused on the resurrection, on the teachings, Saul took the new name Paul and focused on the Good News that the Christ had come to Earth to redeem every one of us. The advent of the intellectual soul age also meant that our innate knowledge of spiritual matters would be pushed into the background by our curious questioning intellectual soul. Suddenly things that were taken for granted, such as the existence of God, were subject to being proven! Rudolf Steiner was a fan of philosophy and knew almost all philosophers(4) but he had little respect for Immanuel Kant, saying that because Kant can't prove the existence of God in his own time, he generalizes this to all times, mistaking the specific for the general. In 1903 a learned professor Newcomb proved it was impossible for man to fly in a heavier than air machine, unaware that the Wright Brothers had already done exactly that. What is impossible in one age, may be possible in another. Every statement about what is possible is true, up to a point — as Korzybski wisely advised scientists to qualify their statements. [page 60] So we have had for four hundred years, from the fifteenth century on, the human intellect, which, left on its own, can never penetrate the idea of God. within this period, something very curious occurred, which has been held very much against us, because we noticed it. The philosopher Immanuel Kant lived at the dawn of this period, in the eighteenth century, and nothing less happened to Kant than that he confused the individual character of the human soul since the fifteenth century with the universal nature of the human soul itself. When Kant confused the character of a specific human such as himself for the general character of all souls, he made a serious miscalculation, which Rudolf Steiner called him on. The recognition of Kant’s error and the vindication of Steiner’s correct position on this matter awaits rectification on the part of those who call themselves philosophers. This matter inspired me to write a poem about Sergeant Kant and General Kant. and he was right, by God! But in Sergeant one Kant, by God. [page 60] From that position he came to the odd conclusion that human beings can never arrive at a knowledge of God from within themselves — while he really should have said that this is impossible only since the beginning of the fifteenth century. But as Lucifer had a good grip on his collar and made him an arrogant fellow, he believed it was true for the entire human race. When I first began writing reviews, I was writing in long hand in ink. I learned that engineers write in pencil and historians wrote in ink. As a physicist, I could choose either and I found myself an ink pen that I liked and used it each day. I was writing two pages each day as part of a free-writing exercise suggested by Peter Elbow, keep writing no matter what gets down on paper, and the censor in your mind will soon give up the ghost and stop censoring, it worked. One day while taking out paper and pen, I recalled that the previous day I had finished reading a book. AHA! I thought, CONTENT! And so I wrote merrily along filling up two pages with my comments on the book I had finished. Soon I looked forward to finishing the next book so as to have content to fill my two pages with. That process began in 1981 and by 1989, I had a computer at home and could record my thoughts directly in digital form by simply typing away on my computer. Soon my reviews appeared directly on the screen in front of me as I typed on the machine. Then sometime about 1995 or so, Dragon Naturally Speaking arrived with my new copy of Word Perfect, my word processor. Diligently I trained my Dragon to understand my tonality and my vocabulary and soon I was talking to my computer and it was typing my words for me. But, fortunately, the editing process of the Dragon's attempt to type my words took longer than the time for me to type the words correctly at 60 words per minute, editing taking longer than typing, I soon turned off the stupid Dragon and relegated him to his DVD cage. I mention all of this because Rudolf Steiner predicted this evolution in human writing almost a hundred years ago. [page 61, 62] Today people still learn how to write. In a near future, human beings will have only a memory that people in earlier centuries once wrote. There will be a kind of mechanical stenography which will be machine-driven to boot. Mechanization of life! I will only indicate it through a symptom: imagine the peak of a culture in which people will excavate the historical truth that once there were human beings who had handwritten manuscripts, just as today we excavate what is found in the Egyptian temples. In the last months of his life, the daredevil Robert Evel Knievel, discovered the reality of the Christ and called Robert Schuller and asked to be baptized. On that day, April 1, 2007, it was Palm Sunday and April Fool's Day, Del and I sat in the Crystal Cathedral and heard the testimony of Evel Knievel, how he had found Christ Jesus, on his own, how, alone in his room, the Christ spirit had come to him, and now he wanted to be baptized. An avowed atheist all his life, this daredevil had taken the biggest jump of his life, had jumped over the chasm of materialism to Christ Jesus(5). This is just one example of a type of conversion to Christianity coming as a result of Christ in the etheric plane appearing to those who call to Him in our time, an event coming ever more frequently since about 1928, just a Steiner predicted it would. No need for proof that God exists if Christ Jesus comes directly and reveals Himself to you. [page 65] A deepening of the forces of spirit and soul is being prepared in the womb of the spiritual current of thought. And while the mental powers on the surface will increasingly deny the Christ, deeper spiritual powers will appear and will seek the Christ more and more. An increasing number of people will see Christ, as he enlivens the etheric sphere and is found by people who are receptive. For that reason we speak of an etheric existence of Christ in the twentieth century. We will then know from our own experience that at the Mystery of Golgotha the being called the Christ truly entered the earthly sphere, and more and more people will know who Christ is, for they will see him. Someday handwriting will disappear and Christ will walk with us and talk with us Steiner tells us. The signs of this happening are all around us even today. My handwriting remains with me in the notes I scribble in the margins of my books as I read them. My date-glyphes record the day on which I read and wrote in that page. I have known for some time now that my date-glyphes record the way the way I am feeling at the instant I draw them, as does my handwriting. "A physiognomy of the soul still appears in our handwriting" Steiner says on page 67. Physiognomy is reading the character of a person from the face, and similarly one can read of the content of one's soul at the moment of writing or drawing by one's own hand. Soon, Steiner tells us such reading will be impossible because of machines, handwriting will become as quaint historical remnants of previous cultures such as the cuneiform tablets of Babylon and the hieroglyphics of Egypt. [page 67] The same mouth that will announce that there was once such a thing as human handwriting will announce, out of the spiritual side of things, that Christ is alive in spirit and once again walks about among human beings. People will have to exchange the spirit of mere thinking for the spirit of direct vision, of direct compassion and shared experience of the Christ who is spiritually alive and walks at the side all human souls. As promised, we begin the details on the three sacrifices of Christ which were made in the spiritual world prior to the turning point of time we call the Mystery of Golgotha. It was only through these three preliminary sacrifices that humans were able to survive to the time when Christ came to Earth and walked it as a human. The first sacrifice involved an ameliorization, a mellowing-out of the senses, that was required to overcome the intense attack by luciferic and ahrimanic forces. This occurred during the Lemurian period, the Great Epoch which proceeded the Atlantean Epoch, when the Earth and humans were still in early formative stages and would be scarcely recognizable to us today. Lacking bone structures, for example, humans could stretch their limbs as far as they wished. Into this period of evolution the first sacrifice came. [page 69] Let us look back to the Lemurian period, when the human being bound itself with its sheaths, and see how the being of the human being would have formed itself if only the forces of the cosmos with which it was connected at the time had worked on it. There was a danger at that time that the twelve cosmic forces at work on the human being might lapse into disorder. Because of this disorder, the human would have had to develop in a totally different fashion than is the case today. The senses of the human being, which were taking form back then, would have become hypersensitive under the influence of the powers about to lapse into disorder. The present-day human being can calmly take in light sensation, all perception. Under the influence of the luciferic-ahrimanic attack, the life of the senses would have released the most powerful desires and impulses. For example, if human beings saw the color red, as would have been the primary effect of the rays of the Sun, the soul, filled with desire, would have had to flee in burning pain, and with the perception of blue, the soul would have been consumed within with agony. The soul would have had to suffer terribly with every sense impression, driven from animalistic passion and desires to scorching pain and torture. The spiritual being who was the agent of this sacrifice appears later incarnated in the Nathan Jesus described in the Luke Gospel. Here's how the events proceeded. [page 69, 70] Then the agonized scream of tortured humanity made its way up to that spiritual being (that being which would later incarnate in the Nathan Jesus). The scream of humanity drove this being to the Sun-Spirit, so that it could let itself be infused with the Christ. Through this infusion, the inner power of sense perception was made milder and the most powerful temptation of Lucifer and Ahriman was repulsed. Because it reduced the excessively strong effect of the forces on the senses, it transformed perceptive life into a moderate passivity. The first sacrifice moderated the sensory inputs to the human being; the second moderated the organs of ingestion of air and food. This happened at beginning of the Atlantean period, and again the same spiritual being let itself be infused with the Christ spirit and save human beings from a living nightmare. [page 70] Let us proceed further, into the Atlantean period. There a new danger hovered over human beings: through the luciferic-ahrimanic influence, the life processes, the life organs of the human were threatened. For example, the presence of food would have awakened an animalistic desire to gulp it down. The soul would have been nothing but desire. Breathing would have been especially sensitive. Bad air would have filled the human being with shuddering disgust. Everything associated with nutriment and life functions would have released a monstrous goading of sympathy and antipathy; it would have driven the soul from voracious desire to repelling disgust. It may be difficult to imagine humans being this way, but notice that there are humans today with various kinds of diseases which make them super-sensitive to light or touch and others who have strong gustatory appetites or strong aversions to smells or foods. These abnormalities give us a reminder of what everyone's life would have been like but for these two sacrifices. The third sacrifice came at the end of the Atlantean period and involved the three human functions of thinking, feeling, and willing. These comprise a set of things we all take for granted, often confusing them or blending them together. For example, I may will myself to mow the lawn, but I say, "I think I'll cut the grass." I may feel hot, think that a cold beer would cool me down, but I might say, "I want a beer." Want is usually the way we express a will to do something. If you will take the trouble to separate your own notions into thinking, feeling, and willing, you may find it helpful to clarify your own goals and wishes in daily life. [page 70] At the end of the Atlantean epoch, a third danger arose for human beings through the luciferic-ahrimanic influence. There was a danger that the human soul forces, thinking, feeling, and willing, would lapse into disorder, into disharmony in relation to each other, so that the three forces would no longer harmonize properly in the human soul. Glowing with passion, the human being would have followed every impulse, or, filled with fear or hate, would have flown from it, without reason having the possibility of regulating the forces. How did this spirit being bring help? It had to dive into the passion-filled human soul, and become the passion itself; it had to become a dragon, in order to transform the soul forces by letting itself be illuminated by the Christ spirit for a third time. Here is the origin of the Dragon in the myths of St. George and the archangel Michael who are pictured as holding a writhing dragon or serpent at bay while preparing to dispatch it. The battle goes on, to this day, and the dragon still lives, but is muzzled with the help of Michael is the message. Now we can understand the summary of the four sacrifices of Christ and how they were applied to the human being's four bodies, physical body, etheric body, astral body, and "I". [page 71] Three times, therefore, before the Mystery of Golgotha occurred, did Christ connect himself with humanity from within the spiritual worlds, through the threefold penetration of the spiritual being that was later the Nathan Jesus boy: first in the Lemurian epoch to regulate sense experience, second at the beginning of the Atlantean period to regulate the life forces, and third at the end of the Atlantean period to regulate soul forces. Only then, as the fourth intervention, the Mystery of Golgotha was accomplished to regulate the "I" in its relation to the world. In studying Roman history, much is made of the dream of Constantine which led to his becoming a Christian, but scarcely anywhere can you find the converse side of what led his opponent to defeat. Constantine followed the portents in his dream which led him outside the gates and promised to become a Christian if he won the battle. Maxentius followed the advice of the Sybil and marched his army outside the gates of Rome against all common sense. Apparently Maxentius was the "greatest enemy of Rome" which the Sybil predicted would be defeated if he marched outside the gates. The win by Constantine led to conversion of Romans into Christians and to the preservation of Rome in the name of the Holy Roman Empire for another millennium or so. [page 72] Without the Mystery of Golgotha, the sibylline element would have prevailed over and suppressed the conscious "I" forces. The "I" would have been lost to the development of humanity. We see the Christ impulse at work as a force in the course of humanity, even without human consciousness of it, as a power that forms cultures, that forms the history of the European peoples, and that determines the shaping of Europe. On the twenty-eighth of October of the year 312, Constantine defeated Maxentius. Maxentius had consulted the Sibyls and received the answer: "If you bring your army out in front of the gates of Rome, you will defeat Rome's greatest enemy." Directly afterward, Maxentius had had a dream, and he followed the utterance of the Sibyl and the dream. He marched out before Rome against all reason and against the advice and all the plans of his generals. Constantine also had a dream: he saw how, carrying the banner of Christ before him, he prevailed over his opponent who was four times stronger. Against all human reason, the battle took place, and Constantine won, carrying the cross before his army. As a result of the four Christ sacrifices, human beings learned in sequence: 1) Standing 2) Speaking 3) Real Words and 4) Thinking through our "I". This is a synopsis of the details Steiner provides in Lecture 7 The Christ Impulse Across the Ages (Pages 76 to 91). [page 86] The pouring forth of the Christ impulse happened for the first time in the Lemuria, when Lucifer threatened the upright nature of the human being. It happened a second time in the Atlantean age, when human beings were snatched away from the danger that threatened their speech through the fact that speech is expression from within outward. There was a danger of speech lapsing into disorder. Towards the end of the Atlantean age, a third intervention occurred through Christ's interpenetration of the being, who later became Jesus of Nazareth. Through this act, the gift of speech, insofar as it became a sign for external things, was saved from danger. The fourth danger concerned thinking, the inner representation of thoughts. Human beings are saved from this danger through penetrating with their thoughts such forms as that which has flowed out through the Mystery of Golgotha into the spiritual sphere of the Earth and which can live within us, if we are willing and have prepared ourselves through spiritual science. And life should become the light of my "I." If we grow grain, we can do two things with our harvest. We can consume the grain or save it to plant new grain. Our knowledge of the material world is like the grain we harvest and eat — it cannot produce new grain for us. [page 101] However, thinking can achieve two things. It can develop properly, which can be compared with the development of the seed to the blossom. But the seed can also serve for human nutrition, in which case it will be torn out of its regular, continuing flow. If it stays in its continuous flow, it develops into a new plant; predictably, life for the future comes from it. It is the same with human thinking. We can say that through it we make pictures for ourselves of our surroundings. However, the employment of such knowledge is like using the seeds for nutriment. We drive thinking from its flow. If, however, it remains in its flow, then we let it live its own seed-life. We let it unfold in meditation and inspiration and let it develop itself into a new, fertile existence. That is the right flow of thinking. In the future, we will recognize that what we have regarded as knowledge of the world behaves like the grain that does not progress to the new grain, but rather is driven out into a totally different flow. But the knowledge we learn through knowledge of the higher worlds is the thinking, that is philosophically comprehended in freedom and that leads directly into spiritual life through meditation and concentration. In Steiner's The Fifth Gospel, he reveals the source of the Lord's Prayer which Christ Jesus taught to his disciples. It came to Jesus of Nazareth while he wandering around as an itinerant carpenter during his young adulthood of 18 to 24. He had entered a pagan area which had long been abandoned by priests. The sacrificial altar had long been abandoned and was surrounded by demons. As I read about this episode on pages 110, 111, I was reminded of watching a modern sacrificial altar being dedicated into service at my family's church, the Holy Family Catholic Church. The church itself was being sanctified and the purification of the altar consumed much of the time and attention. It was a large wooden altar and the priests spread the sacred oils blessed during the annual Mass of the Chrism all over the top of the altar, ensuring it covered every square inch. Sacred oils were also applied in other areas on the walls behind the altar. The way the oils of the Chrism are made is to add new olive oil to the blessed oils remaining from the previous year and blessing the new oils which will have traces of oils going back three hundred years to founding of the St. Louis Cathedral in New Orleans. Minute parts of oils have been blessed over three hundred times by thousands of priests over the centuries. On this altar the Sacrifice of the Mass would be celebrated from then onward. But the altar in Jesus's youth had been abandoned and demons had gathered around it. When he was pushed upon this once sacred altar, the demons seized Jesus and he felt flat upon it as if dead. The people fled in fear. [page 111] While falling into unconsciousness, Jesus of Nazareth saw the demonic powers pursuing them. Then he lost normal consciousness and was carried off into spiritual worlds where he could now perceive what had once been revealed to the priests of the ancient mysteries in purity and truth. He could perceive the ancient pagan revelations, just as he had perceived the Hebrew revelations, in the voice of the Bath-Kol. [page 112] A new great pain was stored up in the soul of Jesus of Nazareth. He had before him an especially clear case of the miserable state of the pagan revelations, and now he could contrast it with what they had once been. And just as he could say in the midst of the Hebrew people that, even if the voice of the great Bath- Kol were to sound forth, he would be isolated with it because they could no longer understand it, now he could say in respect to these people that if the voices of the ancient pagan mysteries were to sound again everywhere, there would be no one there who could understand it. Thus, Jesus of Nazareth was destined to experience the declining development of humanity in the deepest anguish. The next episode in the young adulthood of Jesus of Nazareth concerns the community of the Essenes. He did not become an Essene, but they confided their deepest secrets to Jesus. [page 112] While he was back at home in Nazareth between his twenty-fourth and thirtieth years, he came into contact with the Essenes, who had settlements in the immediate area. He did not actually become an Essene, but due to his deep soul life, through the great twofold anguish that had been stored in his soul and transformed into love, the Essenes accepted him and spoke with him often about their deepest secrets, which they otherwise would have spoken about only to their own, to initiates. Only to him did they speak of their deepest secrets. And among the Essenes he became acquainted with people who at that time aspired, through a special inner development, to climb up again to the point from which humanity had devolved downwards. He took in eagerly what he could learn from the Essenes about the human development for such an ascent. The next event taught him that what the Essenes were doing was detrimental for the rest of humanity, because humanity in general had to learn to find a balance in their lives between luciferian and ahrimanic forces, and the Essences simply isolated themselves to keep those forces out. Jesus realized a need existed for all the people. [page 113] One day, as he was leaving the house of the Essenes and went through the doorway, he had an especially notable vision. On either side of the doorway he saw two forms, which he later knew to be Lucifer and Ahriman. They ran away from the door into the rest of the world. Through what he had gone through in his own inner development, he was now so advanced that he could, so to speak, read the meaning of this flight of Lucifer and Ahriman from the Essenes' door in the occult script. He saw that it was still possible at that time for individual people to rise up to the spiritual heights through a special development of their souls. However, this could happen only at the expense of the rest of the humanity; for only a few elect could go through the Essene development, and they could do so only because others remained at lower levels. He knew that the Essenes freed themselves from Lucifer and Ahriman through their mystical development, and that Lucifer and Ahriman had therefore to flee from the Essene houses. They ran straight to the other people and attacked the rest of humanity all the more. And from this occult experience the third great pain came upon him, when he realized that, while certain especially elect people could ascend to what had been revealed to people earlier, they could only climb up at the expense of the rest of humanity. That almost tore his heart out, for he was filled with love for all people. This event caused him such consternation that he went to speak with his mother. [page 114] And he spoke to her in such a way that this conversation had a deeply shattering effect, even when deciphered later by esoteric research in the akashic chronicle. What he said reached his mother not just as words, but as living forces, which carried the essence of the soul of Jesus of Nazareth as if on wings into the essence of the soul of the mother. So deeply connected was Jesus of Nazareth with what he had to clothe in words that his suffering and his knowledge flowed with the words over into the heart and soul of his mother. And it was as if his mother were imbued with a new life; as if rejuvenated, she came to life anew. What he shared out of the depths of his soul gave his mother a new life and left Jesus feeling desolate. The great spirit Zarathustra (a.k.a. Zoroaster) had left Jesus' three bodies, physical, etheric, and astral bodies, without an "I" and he wandered off aimless in the direction of the Jordan where John the Baptist was baptizing. The forces were set in motion for the empty Chalice of the Nathan Jesus at age 30 to receive the Christ spirit as his new "I". [page 115] I did not wish to speak abstractly about the development of progress in the understanding of Christ; rather I wanted to demonstrate concretely what sort of Christ knowledge can be attained through esoteric science today. It will have become apparent to us from to day's discussion that spiritual science, as we mean it, can be an instrument for ever deeper knowledge of the Christ. It is to be hoped that when humanity has come so far in rejecting old religious ideas about Christ because of materialistic influences, then modern spiritual science will give Christ back to humanity once again. For .this spiritual science is not speaking out of theories about Christ, but rather in consciousness of the very words of Christ: "I am with you until the end of the Earth's days." For Christ is poured into the aura of the Earth, in which we ourselves are embedded. He lives within it! And, just as the apostles once lived with Christ Jesus on the physical plane, so can we communicate and associate with him as a spiritual being in the Earth's aura, if we appropriate this possibility. We must only accustom ourselves to really grasping the living presence of Christ in the Earth's aura and not to identify Christianity as a mere teaching, a mere doctrine. Since the Mystery of Golgotha, Christ is here all around us. We can find him in the same world we are in, not in a physical form, but as a spiritual being. We have completed our "Approach to the Mystery of Golgotha" with Rudolf Steiner as our tour guide. He has shown us the ancient sacrificial altar and described how Jesus received the Lord's Prayer from it, he took us to the dwellings of the Essenes and showed us the luciferic and ahrimanic demons at the doorway, he let us eavesdrop on the conversation of Jesus with his mother before his baptism by John, and even more. What Steiner cannot show us is what we must see and experience for ourselves: how the etheric Christ lives upon the Earth and comes every day to people who call Him for help. We find him not as a man we must make an appointment to see, but someone who will come as soon as we ask Him for help with our whole heart and soul. The Mystery of Golgotha was not just an event played out two thousand years ago, but one which extends into our world today. The time is now, the place is here. Footnote 1. One need only read the attacks made in recent years against Steiner-based Waldorf Schools to get a flavor of the fear-driven fervor of materialists against spiritual science. Footnote 2. See this footnote: http://www.doyletics.com/arj/ocphysio.shtml#N_3_ and the review it appears in for more details on brain sand, including its medical description. Footnote 3. There is always a time delay between the changes a new age brings in human understanding and changes in our culture to accommodate the changes. I was fascinated to watch the intellectual soul of the US Constitution's laws do battle with the forces of the consciousness soul in the impeachment by the US House of Representatives of President Clinton. The House of Congress impeached him on intellectual soul grounds of law, and then the Senate refused to confirm the impeachment, based mostly on consciousness soul considerations. This aspect of the impeachment proceedings flew under the radar of all the media commentators, but caught my attention as I was at that time first trying to understand the intellectual and conscious soul ages. Footnote 4. See his large book, The Riddles of Philosophy, if you wish proof of this statement. Footnote 5. Robert Eval Knievel was to die a few months later, but his appearance on Robert Schuller's international broadcast of The Hour of Power brought hundreds, perhaps thousands to Christ. Footnote 6. In my review of Steiner's The Fifth Gospel you can read the prayer in its reversed order and normal order.